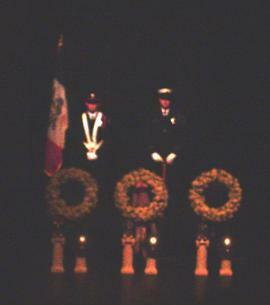 About a thousand people turned out Thursday afternoon at North Iowa Community College in Mason City for a memorial service for the three victims of last week’s medical helicopter crash. Nurse Shell Lair-Langenbau, paramedic Russ Piehl and pilot Gene Grell were killed when their Mercy Air Med chopper crashed north of Ventura on January 2nd. Joseph Ferrell, of the Iowa Bureau of Emergency Management Services, says the emergency responder community is in mourning for the three lost lives. Ferrell says they don’t think of something like this happening to members of their own EMS family, especially when they are trying to help someone. He says in circumstances like this, they are great about coming together and leaning on one another, because people still need their services. Mercy Medical Center-North Iowa CEO Dan Varnum just started his position recently in Mason City and says he didn’t get to know the three victims as much as he’d have liked, but he’s heard a number of great stories from others. 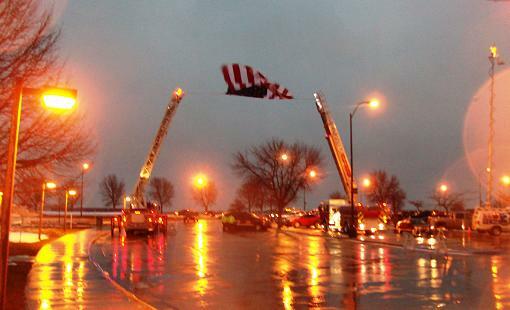 A giant American flag is suspended from two fire truck ladders outside the memorial service. Varnum says the victims had a tremendous impact on many people through their years of service. He says when he thinks of the work they’ve done over the years, about the lives they’ve saved and the impact of those lives on others. He says they’ve touched people in ways that most of us can’t even begin to imagine. Fred Buttrell is CEO of Med-Trans Corporation, the company that provides helicopter service to Mercy-North Iowa. He says he’s witnessed relentless efforts and compassion by family, friends, and co-workers during this tragic time. Dan Dwyer is the senior vice president of mission integration with Trinity Health, Mercy’s parent company. He says the work of emergency health care can be a blessing and a challenge to all as shown with this tragedy.